USS Kidd in very low water. Wow, the water is low. 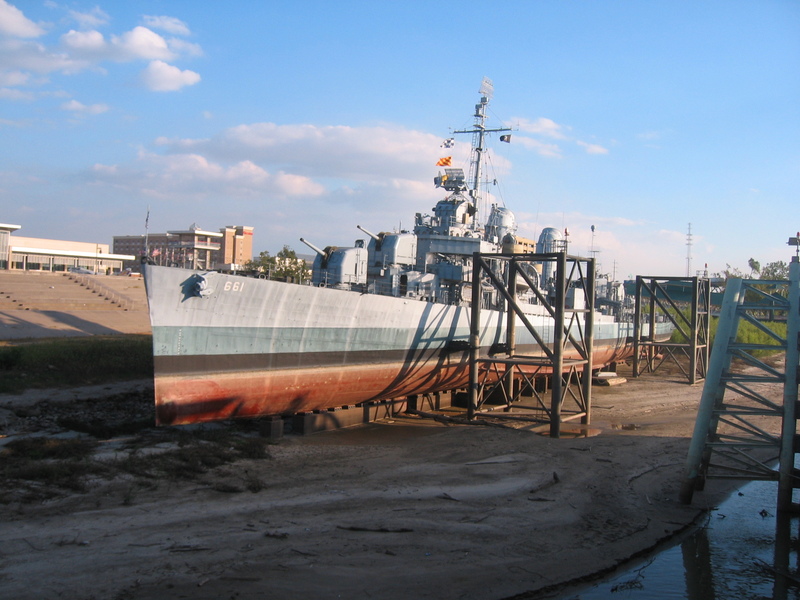 We dock near the USS Kidd and today it is sitting in its cradle with dry riverbed showing underneath. As the water rises, the Kidd floats up along a brace that holds it in place. Good design for the lower Mississippi where the river level can vary up to 60 feet in a year! That sounds like the swings of my emotions in the last few days! 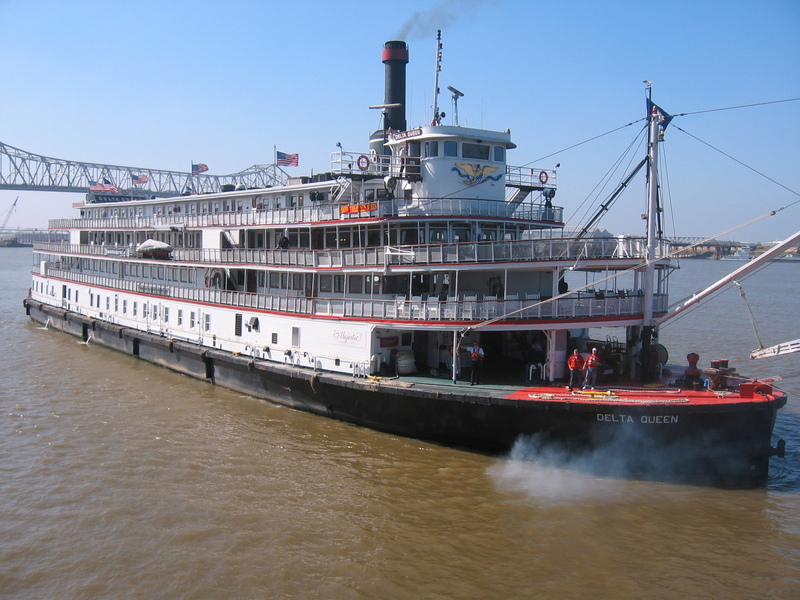 The Delta Queen pulling in to Baton Rouge. We had several media today and I was busy with interviews. It is so encouraging to see the media interest in the boat. Perhaps the only positive thing about the boat’s “retirement” is the media interest that is generating. Hopefully this coverage will help garner the civic and political support we will need to get the legislation passed. 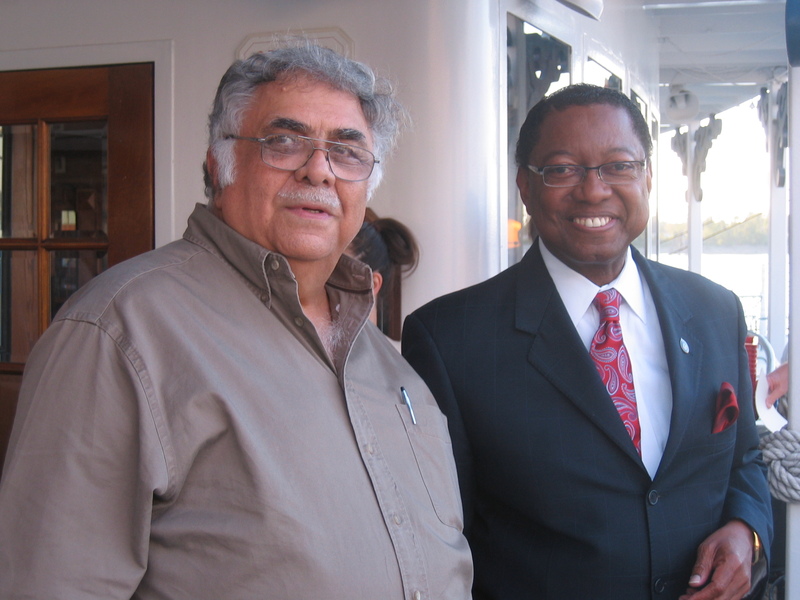 St. Francisville, LA mayor Billy D'Aquilla and Baton Rouge mayor "Kip" Holden. We enjoyed sharing todays Tribute Event with St. Francisville, LA mayor Billy D’Aquilla and Baton Rouge mayor “Kip” Holden. The DQ was scheduled to visit St. Francisville only once this year at the beginning of the season but the water was too high to dock there. So, we invited the mayor and some of his staff to come down and join our event in Baton Rouge. It was a lovely day and a nice event. The DQ stayed a little later after the AQ pulled out to help the AQ guests get a more restful night’s sleep.